Tattoo Blog » Meet Valerie Vargas! 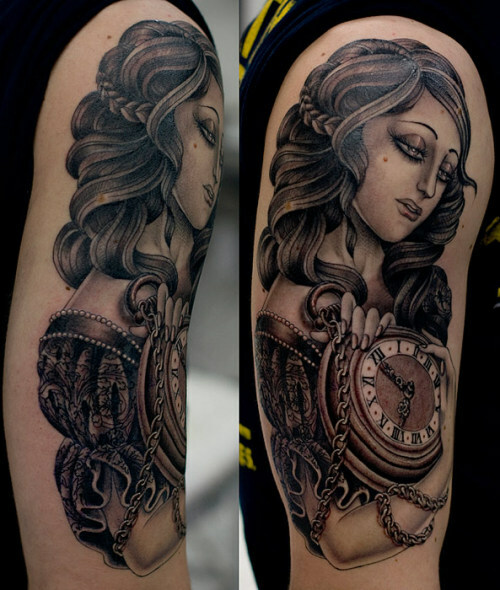 Tattoo Blog » Inspired » Meet Valerie Vargas! Oh man, Valerie Vargas blows me away. Straight up, that’s all there is to say about it. When I come across an artist like Vargas and then I find out that they’ve only been tattooing for a short period of time (since 2007, in Vargas’ case), I’m really in awe. I mean, in terms of learning an art form, three years is absolutely nothing. And yet Vargas tattoos like an absolute seasoned pro. Hailing from Scotland, Valerie Vargas made her way to England and currently tattoos at one of London’s preeminent tattooing establishments, the Soho based Frith Street Tattoo. She’s certainly a busy lady, judging by the fact that her waiting list is currently closed until further notice, which is always a good sign. She’s got a downright masterful grasp on the classic American style, making it pop when it needs to pop and go down smoother than a healthy dose of Wild Turkey when it needs to go down smooth. The classic American style has never been my favourite tattoo style, but when I see artists like Vargas pull it off so well, I find that it is rapidly becoming one of my favourites. Unfortunately, I don’t know much more about Valerie Vargas that I can tell you. I do know that she has some prints for sale at her website, as well as a tote bag and a sweet T-shirt that I can’t seem to figure out how to buy. It seems to me that they’re only available at the Frith Street shop, but from what I can tell, you have to actually go to the Frith Street shop to purchase such merchandise. Oh well. So yeah, check out Valerie’s stuff. It’s worth the time, worth the effort and it’s definitely worth putting yourself on her waiting list (when it opens back up again), should you be in the market for a superbly done tattoo.